med men: Toulouse - to-home. Up at 7.00 for petit dejeneur on our own at the HDM, and it's a treat to have cereal, a croissant and milky coffee before we set off. 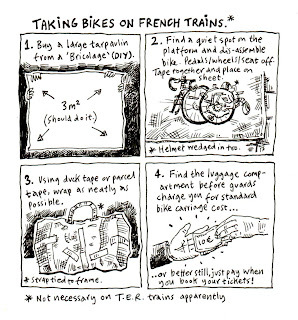 It's five minutes to the station and the process of dismantling and packing the bikes goes smoothly enough. A small, sunburnt chap pulls his ancient steel framed bike and bodged together trailer next to us. He's a dead ringer for Bilbo Baggins, but is in fact Simon, a teacher from Paris. Simon, who's English, tells us to check the platform display against our tickets to see exactly where our carriage will pull in. This seems ingenious and high tech to us, but doesn't quite work out that way when the train pulls in and our carriage stops 100 metres or so from the spot predicted. On the train, we find a good space for the bikes, and settle in. The 'Corail Teoz' coastal train runs up the Spanish coast from Barcelona and past Perpignan to Narbonne, before heading west to Toulouse and ultimately north east to Paris. It's spacious compared to a UK intercity train, with loads of spare seating and wide aisles. A lady we'd spoken to earlier invites us to take on her 7 year old at Chess and James, taking her seat obliges. It's a tight affair and the champion of Pays de Galles has to work hard to beat the French prodigy. Mike struggles even more and is glad to take a draw when the train pulls in to Toulouse. The kid and his sister take it well, even though they were desperate to pummel les Anglais. We're both touched to be invited briefly into the lives of strangers in a way you wouldn't often see in England. After a long day wandering around the cafe's of Toulouse, looking for presents for our girls and franglaising the locals, we nip into the Gaumont on Wilson Square to kill a few hours before catching the 'corail lunea' night train to Paris. After yawning our way through most of 'Inception' we sneak out and leg it down to Gare Martibeau in time to get our stinky gear out of luggage locker and re-tape up our bikes, left standing outside the station. After 10 minutes on the Lunea, we're called to the back where an angry train manager and smiling conductor tell us we can't leave our bikes where the platform guard had told us to 15 minutes previously, and harangue us into paying a 20 euro 'bike reservation fee'. We protest that bagged bikes are 'baggage' according to their own website but no good. We pay up, move our tarp covered bikes down the train at the next stop, Montaubon and settle down to 8 hours of semi- comfortable travel in our reclining seats. Our contraband lagers help. 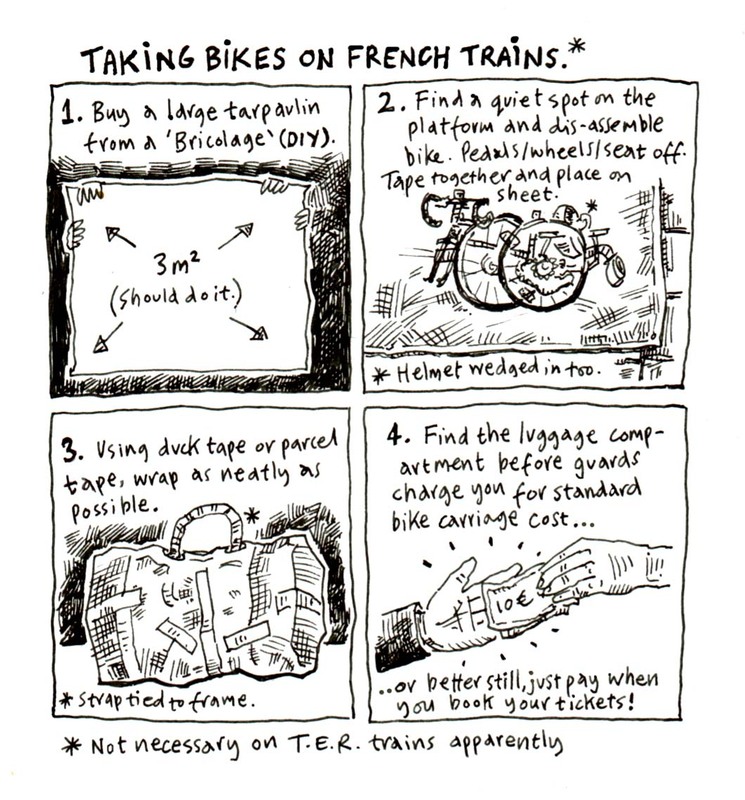 Out into an overcast day in Paris at 6.45 and we're careful to hide our pen-knife from the French military patrolling the platform with sub-machine guns as we take the tape off the bikes and get ready for the day. A whistle stop cycle tour of the sights entertains us as we try to get our photo's taken in various mugging poses at, in order of visit: Notre Dame, The Louvre, Cleo's needle, the Arche, the metropolitan metro sign, the Eiffel tower and Hotel des Invalides. Mikes cracked back wheel copes well and our main target is to get to Gard du Nord in time to ensure we pack the bikes even smaller and avoid any more hassle. Mike replaces his 2 day old T shirt with a cheap Kenvelo job outside the GDN and James fails in his final attempt to order 2 large coffees, "Der Cafe Grand oo lord, sil vous plait?" On the station before boarding, Mike spots an ingenious old tramp, fondling and jiggling a plastic waste bag from underneath, before going elbow deep into the yoghurt pots and god knows what before emerging with a damp 2 euro coin. His success rate looks to be higher than the teams of girls purporting to be Bosnian refugees showing pleas in written english to tourists. The GDN area is heavily populated with addicts and beggars of all description. Eurostar check in is straightforward, even after Mike loses his ticket on the platform, and the journey to St Pancras fast and enjoyable. Looking at the flat open plains of NE france, we're glad we opted for the variety/hills of the west. In contrast to the Eurostar, the Pendolino to Stoke feels like it's going to break up when it hits 100mph. We're back in the world of women, clean clothes, beds and reliable access to toilet paper as we step off the train and into the arms of my wife, and in James case, his daughter Lauren.